Old School Bobber Builds, Kits, and Advice! The process of selecting old school bobber parts can be quite perplexing. 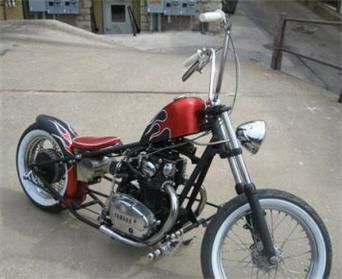 Much of the problems lie in the mass of choices available in old school chopper bobber kits and parts to choose from. Phantom Circle, Biker's Choice and many others sell chopper innovations in kits available to anyone wanting to build a chopper. Today these custom chopper kits can fit the wallet of many (whereas in the past it was for those with many more resources). With a kit comes the instructions you need and almost all the components required to build your dream bike. 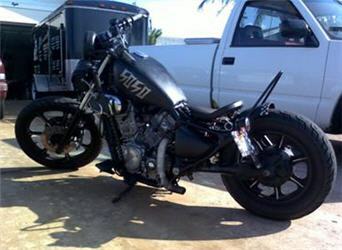 Your first step will be determining the type of old school bobber look you want to own. This will refine your choices of old school bobber kits to a more manageable number to choose from. You should also figure out your budget, and be prepared for a few unexpected extra costs along the way too. Don't forget labor for steps you can't do yourself. The prices put together might seem steep and leave you considering the possibility of building your own bobber entirely from parts you have and can find. With the right knowledge this is actually doable. Though you are on your own, as this method wouldn't have parts that you can plan for from the get go, nor a plan that can ease being complete and knowing where your personal limits stand. An old school bobber kit can save you a lot of grief and potentially money anyways. A lower end kit might be an option, and would still get you a sound bike that is safe as well. It would still come out something closer to Jesse James's works, and you could have enough money left to grab food on your first run, and a pig roast when you get back home. While you choose the parts within your old school bobber kit, be sure to consider real parts that are currently available and you will have a better idea of your actual budget needs. Even with the most brilliant design idea, you might run out of money and not the chopper you wanted. Make sure to see as much as you can in the parts available before deciding on them. It might still be wiser to get the most complete bobber kits as you will find the quality steel tanks, engine, exhaust pipes, tires, hardware, and hopefully the seat, headlight, controls, etc. Chopper kit extras will vary dramatically by the brand chosen. You will no doubt have to get paint and maybe battery acid elsewhere regardless. Speedometers, mirrors, and other street legal accessories are seldom included in bobber chopper kits too. When looking for these, buying a complete set packaged together should result in a more uniform ride, Taking the time to consider all the details, and building them as specified, will indeed make your build a riding dream come true. It's worth a little extra time, if it makes everything that much better.